I remember a petite 13 year old Vahid Mirzadeh coming to the Port Washington International Championships. He was certainly a good player for a 13 year old, but basically he was known as Hamid's little brother. Now Hamid Mirzadeh is at the University of Florida (a top-ranked college player, actually) and Vahid has come into his own place as an incredible player. The Floridian, whose high point this year was winning the doubles championships (with Phillip Simmonds) at Kalamazoo and the wildcard that came with it, is now 17 years old and quite a bit taller. He spends most of his time traveling around the world on the ITF circuit. While Vahid doesn't own very many international trophies, he manages to place in the top eight of nearly every tournament he has entered. Over the next year he will make the difficult decision of whether or not to follow in big brother's footsteps and try for a college tennis career. In the meantime, he is playing the USTA Professional Circuit with the same positive results he has had in the juniors -- and he is having fun. I sat down with Vahid Mirzadeh in the Players Lounge at the US Open after he finished an important game of the day -- X-box with Scott Oudsema. 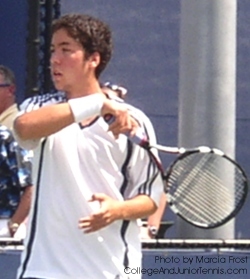 Unfortunately, Vahid's results at the US Open were not what he had hoped, but nothing seems to get this energetic teen down.